Joy Creek Photo Archive (c) all rights reserved The sheer size of the two-foot plus leathery maroon spathe is what stops visitors. 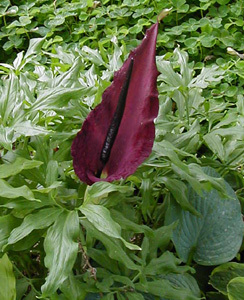 Give Dracunculus vulgaris a well-drained spot at the edge of a woods or in full sun but do keep it away from the picnic table because, when in bloom, the plant smells like carrion. The leaves and stems are attractively mottled in purple. Summer. 5 ft. x 2 ft.